What is a Science Lab without animals to observe?! We have all five vertebrate animals, or animals with a backbone, represented: bird, amphibian, fish, reptile and mammal. I try to be super respectful of all life (except mosquitoes and ticks - that’s MY blood! ), and would encourage students not to take animals from the wild - in fact it is illegal! If you think an animal needs help, then I recommend calling the Chattahoochee Nature Center. During most breaks of a week or more I need help watching the birds, rats and toad. I’d drop off the critters in their cage to your house with food for a week. They can be left up to 2 days if necessary. No cats! Shoot me an email about a month before any break if you are interested! Zebra Finch: “Charlie” (a boy) and “Daria” (a girl) are named after Charles Darwin, the father of evolutionary science, who cut his teeth on the Galapagos Islands studying … finches! Zebra Finches do not like to be handled or to play with toys, so most of the time they sing to each other and work on their nest (which I constantly knock down so they have something to do. Their diet consists of mostly millet and other seeds. These birds come to us from PetSmart. American Toad: American toads are 2-3.5” long and live in terrestrial habitats ranging forest and fields to backyards. You can hear the trill call of the male American Toad from February through July when they are most active at night, spending the day hiding. Adult American toads eat a variety of small insects including ants, beetles, moths, and earthworms; and are prey for several species of snakes, birds, and mammals that are immune to the toxic secretions of their skin. They spend up to two months as tadpoles before becoming toadlets. This toad is on loan from the Chattahoochee Nature Center and is not named. Bluegill: Like other sunfish, bluegills are "tall" and "flat." They have a small mouth on a short head. The dorsal fin is continuous, with the front part spiny and the back part soft and round with a dark smudge at the base. The tail fin is slightly forked but rounded. The body is mainly olive green with yellowish underneath. A close look reveals six to eight olive-colored vertical bars on the sides. Bluegill like to live in lakes and slow-moving, rocky streams. They can often be found in deep beds of weeds. Bluegills are carnivores, primarily eating invertebrates such as snails, worms, shrimp, aquatic insects, small crayfish, and zooplankton. The very small mouth of this fish is an adaptation to eating small animals. They can also consume small fish such as minnows and plant material such as algae. Young bluegill eat worms and zooplankton, staying under cover while adults feed more in the open. These fish are visiting us from Chimney Springs Pond and will return their during summer break. Yellow-bellied Slider: Yellow-bellied sliders can be found in almost any body of water or stream in the Southeastern United States, but can be crowded out by pet Red-eared Sliders that have been discarded by their owners. Sliders can live for more than a quarter of a century, reaching a maximum length of almost a foot! 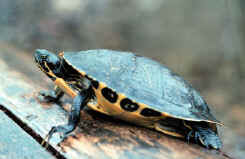 There is a vertical yellow line behind the eye and stripes on the neck, arms, and legs. Yellow-bellied sliders are aquatic, omnivorous, and will opportunistically eat aquatic insects, fish, frog eggs and tadpoles, aquatic snakes and a wide variety of aquatic plants and algae. This turtle is on loan from the Chattahoochee Nature Center and is not named. Fancy Rats: These furry rodents are the domesticated version of their wild cousins, and don't carry the same health risks that wild rats do. They are social and trainable animals who especially like to be out in the morning running around their cage, watching our students. In the wild they would be an important part of the diet for snakes, hawks / owls, and foxes - all of which are doing us a favor by keeping population sizes in check. Their diet consists of nuts, grains, fruit, and rodent pellets. These rats were purchased from PetSmart during the 2017 Solar Eclipse. “Sol” (named for the Sun) is braver than “Luna” (named for the Moon), and more likely to be out and about. Be CAREFUL though, they bite.